There are many moments in teaching university chemistry the past 25 years that I wish I could have back and one of them is sharing (once … once!) 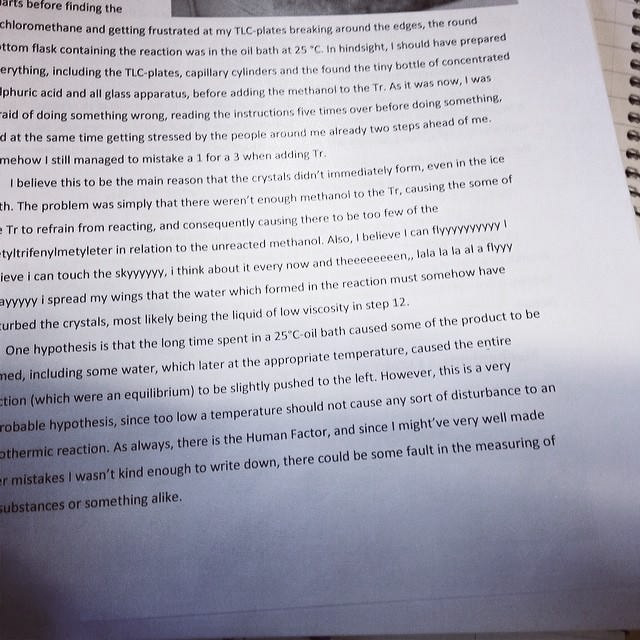 with a class that a student had tested me to see if, in fact, I was reading their entire lab reports by inserting nonsensical words or sentences. The student thinking was that even it I did catch it it would be a ha-ha moment with no loss of marks and if I didn’t catch it then they could make me look bad by pointing out that I was not reading their reports as carefully as they had written them. From their perspective it was a win-win proposition. It became a thing. A very irritating thing. It went on for years. Kill it, kill it now. Being cool and funny for a moment can have you up at 3AM reading footnotes and references for report #5 of 30 instead of doing a marking gloss and having them all marked before Castle comes on. Looks like a roommate trying to mess with him, because the sentence continues fluidly post interjection of the oh-so-inspiring lyrics. mu opinion is that the student must be about 12, and that their unkind word hijacker can write better than they can. As a TA, I wouldn’t have accepted this report anyway. I’m assuming this is the Conclusion section. There is too many “I”s, too much guessing, and too many “hypothesis”. The most disturbing thing about this is not that the room mate screwed around with the report (as Johnny Get Cash suggested) it’s that students aren’t being taught how to write scientifically. Students seem to have this idea that the Conclusions section has to be this one-page-length long rambling run-on sentence in which the student writes about all the mistakes they made. In the end, it doesn’t even show anything that could be concluded from the experiment. There is no connection of the content in the introduction to the results of the experiment. I also found this rambling run-on sentence about all the student’s mistakes to be rather disheartening, but also heartbreaking. What I mean is that I can relate to all the fear and anxiety that the student seemed to be having in lab, and that were inappropriately expressed in this lab report. Scientific writing, or at least a lab report, is supposed to be an objective account of one’s findings. It should not be laden with hopes, aspirations, or anxieties. Yet I am reminded that the scientist, the human who does the reporting, does experience all of these things in their investigations (or organic chem lab as the case may be). As a college student in the middle of my physics undergrad I can say I’ve never been taught how to write scientifically yet have always gotten A’s and B’s on my lab reports. I never feel very confident in my lab write ups though. Any recommendations on where to learn how to write scientifically? Jay: take a look at the freely available supporting information files for papers in jacs (Journal of the American Chemical Society) or Organic Process Research and Development or other good journals. The style in which the experiments are written up is a standard way of writing for theses, research papers etc. I like it! The ACS Style Guide is all for it too. We did it a hundred years ago; read a couple of good, old papers. The passive voice then became the the gold standard. I say we should go back. Back to where we are persons. Now! It is liked! The ACS Style Guide is all for it too. It was done a hundred years ago; reading a couple of good, old papers confirms. The passive voice then became the gold standard. It is believed scientists should go back. Back to where scientist are persons. Now!